Verderers are the people who set the Forest byelaws and regulate the use of common rights in the Forest. The name comes from the French word ‘vert’, which means green. There are ten Verderers- half are appointed by the government, and half are elected by people with commoning rights. The five elected Verderers serve six year terms. The elections are staggered; two places will be up for the vote at one election, and three at the next, the elections being held three years apart. 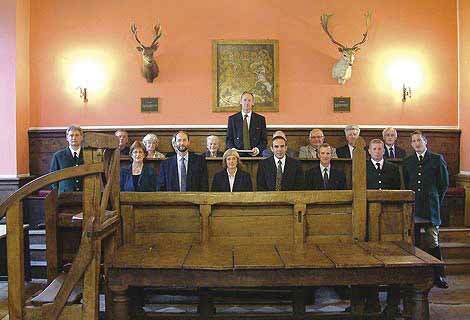 In law, the Verderers have a similar status to magistrates. The ‘Verderers Court’ meets every month, except in August, at The Queen’s House in Lyndhust. The public can attend, and can raise issues for the Verderers to consider- that’s known as ‘making a presentment’ to the Court. The Verderers set the marking fees, which are part of their byelaws. Verderers also have the power to block certain types of planning applications on Crown lands within the Forest. The Verderers have often acted as guardians of the Forest, protecting it from outside pressures. The chairman of the Verderers is known as ‘The Official Verderer’, and is appointed by Her Majesty the Queen.